There is no better way to spend a day in Playa del Carmen than driving your own a speedboat! We offer you a great selection of self drive speedboat tours you can choose from, cruising freely on the clear blue waters of the Caribbean Sea, while the warm tropical sun warms your skin, best of all on your own pace! We offer different tours that combine adventure and relax, so you can make a day on the beach with our great selection. 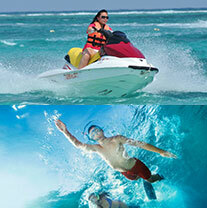 THE BEST SELECTION OF SPEEDBOATS IN PLAYA DEL CARMEN! 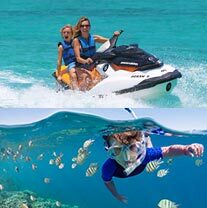 We offer vast choices for you to have of thrilling water activities in Playa del Carmen - driving your own speed boat is one of the most popular. Make sure you book your tour early, as they sell out well in advance, so you don't miss your chance to drive your own speedboat in Playa. 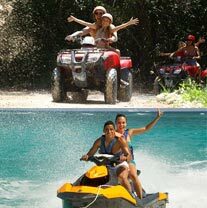 ATV & Speed Boat Adventure - You get your adrenaline pumping with an ATV ride though the jungle and then you can cool off with our speedboat adventure tour. You can also add snorkeling to this excursion to make a full day of adventures in Playa. You can spend the rest of your day relaxing at a beautiful beach! Speedboat Snorkeling Adventure Tour - Ride our speedboat to enjoy a fast and fun zodiac-style snorkeling tour in Playa del Carmen. On this tour you can also use our luxury yacht facilities, you can enjoy from the included open bar and snorkeling on a coral reef. 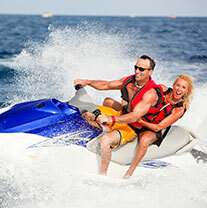 Extreme Jet Boat Adventure - A fun ride for the entire family. This is an exclusive tour from Cancun. On this adventure you only ride as someone else does the driving, taking you through thrilling 360° cookies and getting you REALLY wet. A lot of fun. You don't have to drive, snorkel, or ride an ATV to take this tour! We offer lots of fun combo tours with this one too. Speedboat & Beach Break - Drive your own speedboat and feel the excitement of the ride, enjoy driving through the clear waters of the Caribbean at your own speed on one of our high-speed extreme jet boat. You can then cool of on our exclusive beach club for the rest of the day. You can add ATV and snorkel to make a full day of fun in Playa!